The enthusiastic Trump supporter and former Grand Wizard of the KKK makes common cause with an international rising right. 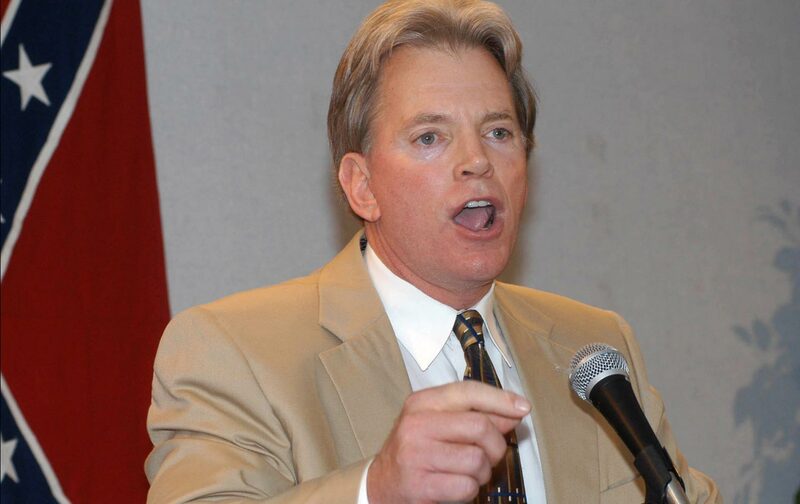 In the wake of Donald Trump’s fear-and-loathing speech at the RNC, former KKK leader David Duke announced he is running for the open Senate seat in Louisiana. Duke has presented himself as a strong supporter of Trump, and it’s not hard to see why. Trump’s message of producing safety by blaming and excluding subaltern groups and perceived outsiders is in total lockstep with Duke’s historic mobilization of racial animus. Unabashed eugenics notwithstanding, in 1991 Duke ran for governor of Louisiana and made it to the runoff against Democratic former governor Edwin Edwards. This race mirrors in many ways the current presidential contest. Duke ran as a Republican in an open primary system against the wishes of the Republican establishment in the state, which had vocally opposed his run for Senate the previous year. He outpolled the other Republican candidates, leaving voters with a choice between a party outsider espousing racially charged attacks on welfare and crime, and a democratic establishment figure facing accusations of corruption that led to his ultimate imprisonment in 2002. During the election, Duke toned down his explicitly racist language and replaced it with anti-government conservatism. He emphasized the problems of black poverty and social dysfunction and tied them to dependency on the “liberal welfare state,” producing problems like high levels of crime, drug use, and out-of-wedlock births. In a refrain familiar to Rudolph Giuliani’s, he said that liberal policies were responsible for murder’s being the leading cause of death for young black men in the state—something he would fix through aggressive drug testing, harsh criminal penalties, and a dismantling of the welfare state. Duke was opposed by Republican leaders locally and George H.W. Bush nationally, who pledged their support for Edwards in hopes of saving the GOP from being tarnished with the reputation of being openly racist. One of the most popular bumper stickers of the race said, “Vote for the Crook, It’s Important.” Edwards won the election, but Duke won 58 percent of the white vote, which was insufficient because of the high number of black voters. Fortunately, Duke again faces a formidable challenge from a likely galvanized black vote and a growing Latino electorate. Trump, however, faces a different national demographic, in which whites are a larger percentage of voters. If he can win this white vote in enough swing states, he could carry the election. Last night’s speech makes clear how he intends to do that. Trump is attempting to fan racial fears with a false claims that Americans are at great personal peril, backed by specious statistics and alarmist rhetoric. Trump cherry picked some numbers to allege that crime is out of control, despite the fact that national crime rates are at historic lows. Violent crime does exist in a small number of very wealth- and resource-poor and segregated communities—a horrific fact, but ironically not one that directly threatens the safety of most voters. Even so, one must place this in a larger framework of violence that permeates all demographics of American life. Eighty-three percent of white murder victims are killed by other whites, and, according to the FBI’s own statistics, blacks are more likely to get killed by whites than the other way around. Trump’s anecdotal accounts of crimes committed by unauthorized migrants are also designed to stir up racist fears while hiding the real truth, specifically that immigrants are less likely to commit crimes than native-born Americans. While the killing of Sarah Root by a drunk driver is a tragedy by any measure, it is not indicative of national trends and should not be the basis for a radical transformation of our immigration or law-enforcement systems—though much change is needed in both. For instance, deportations under the Obama administration reached an all-time high of nearly 450,000 in 2013, driven by DHS raids in homes and workplaces, which have disrupted families and destroyed the lives of migrants recruited as low-wage labor or responding to the consequences of free-trade agreements and US intervention. Some Republican leaders, such as Mitt Romney, Ted Cruz, and Jeb Bush, are following the pattern of 1991 and refusing to endorse Trump, but, unlike in 1991, most have jumped on the Trump bandwagon, embracing his attacks on immigrants and Muslims. Trump’s rhetoric is also in line with right-wing xenophobic politics internationally. Dutch nationalist politician Geert Wilders had high praise for Trump while attending the RNC. According to The Wall Street Journal, he “applauded the GOP candidate’s embrace of what the Dutch member of parliament calls the ‘Patriotic Spring’ sweeping Europe and the United States, much of it centered on restricting immigration. “Angry people have become the middle of the political spectrum,” said Wilders, who is viewed as one of Europe’s most prominent critics of Islam, which he has described as a fascist ideology. The success of the Brexit campaign should be a warning to Hillary Clinton and to the American public too. It was successful in both mobilizing racist anti-immigrant sentiments and creating huge economic risks for the UK, which is facing a major economic slowdown as a result. According to the Financial Times, the UK economy has suffered a “dramatic deterioration” since the vote, with key economic indicators at a seven-year low, predicting major trouble ahead. In the UK, leaders of the Brexit campaign themselves have apparently abandoned the cause, with its two major proponents leaving the field in the wake of their apparent but likely Pyrrhic success. Nigel Farage has resigned from UKIP and Boris Johnson has decided not to stand for election to prime minister, which seemed assured in the immediate wake of the vote. The British public, as well, has a strong sense of buyer’s remorse. The Independent reports that over 1 million voters now regret their vote and would likely vote “remain” if they had a second chance. Many either felt misled by false campaign promises of additional health-care spending or intended only to cast a protest vote without actually wanting to leave the EU. In addition, hate crimes seem to have skyrocketed with the “leave” vote signaling the legitimacy of anti-immigrant extremism. As of today the British police have reported 6,200 hate crimes in just the last month targeting primarily Muslims and Eastern Europeans. Like the Brexit campaign and other right-wing movements in Europe, Trump is attempting to prey on the growing economic insecurity of white voters by directing their anger towards migrants, while elites like Trump profit in power and capital. Of course, this is made possible in part by the centrist defense of neoliberal globalism that not only affects working-class whites but ironically has disproportionately hurt blacks, Latinos, women, and other marginal groups. Democrats need to take this dynamic seriously, or they risk losing both white and nonwhite working-class voters. Trump’s appeals to “one America” and “law and order” are opening a Pandora’s box of racism and xenophobia, neither of which is truly unprecedented in American politics. Republican leaders and the American public have to decide if they are going to embrace a politics of hate by joining the “Trump fall” or repudiate the politics of racism and fearmongering. Alex S. VitaleTwitterAlex S. Vitale is a professor of sociology and the coordinator of the Policing and Social Justice Project at Brooklyn College and the author of The End of Policing. Alan A. AjaAlan A. Aja is Associate Professor of Puerto Rican and Latino Studies and author of the forthcoming Miami's Forgotten Cubans: Race, Racialization and the Local Afro-Cuban Experience.